These crispy, crunchy treats are sure to get every bacon-lover’s tail wagging! 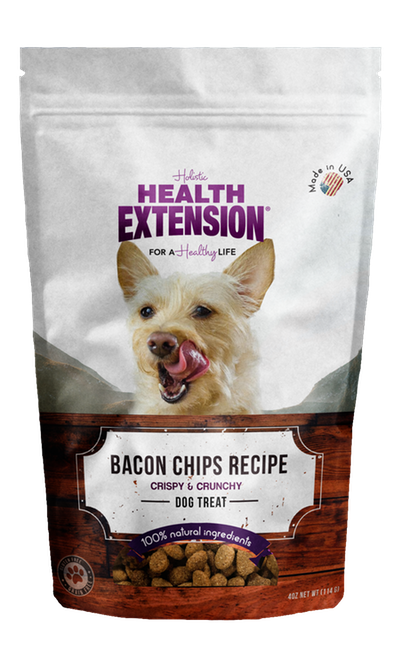 Health Extension Bacon Chips are crafted from three simple ingredients – USDA-inspected beef, tasty bacon and yummy pumpkin, which is rich in soluble fiber. These lean, bite-sized morsels are perfect for treating or training. A tasty nutritious reward for your dog. Break into small pieces for your small breed dog. This product is intended for intermittent or supplemental feeding only.